Gone are the good ol' days where SUVs looked big, boxy, rugged and like they belonged in a jungle. These days, it's mostly about the curves and elegance that blend well into the urban jungle. While there's no doubt that you get some very good looking SUVs now, I sometimes miss seeing a bit of those old school elements. But it's not just that  a lot of them seem to be losing their off-road abilities, and becoming more crossover-like than SUV. 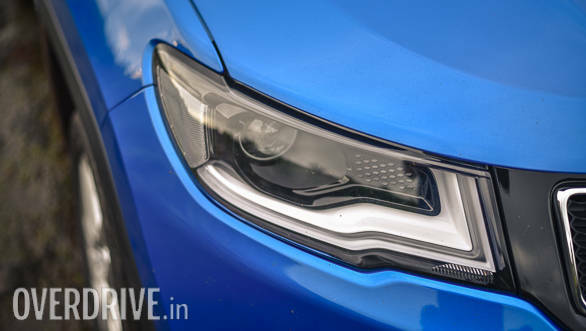 If you did want a proper 4x4, you'd have to look for an SUV that's either in the rather expensive Rs 35-40 lakh price bracket, or for one in the Rs 10-15 lakh range which wouldn't be a very premium offering. 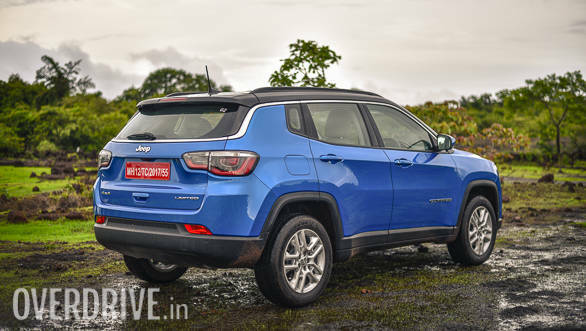 Now however, with the Jeep Compass, you might have an option that sits right in middle. It aims to check the three boxes that most Indians look for -- practicality, a premium feel and an affordable price tag. So, does it? Like I said, SUVs these days look a bit softer and have lost that brutish SUV design. 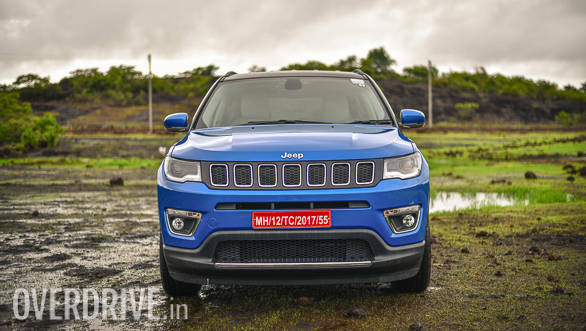 The Jeep Compass's design however, manages to be both  modern and premium-looking as well as rugged and intimidating. When you look at it in person, it doesn't seem very large, but in the rear view mirror, it looks quite large thanks to the wide, square-ish front. What adds that premium touch is the resemblance to the Jeep Grand Cherokee. From the side, it does look quite muscular, but not in an overwhelming way  more like a lean athlete-like rather than a bulky body builder. However, the wheels look just a little too small for the rest of the body and the rear wheel isn't positioned at the centre of the wheel arch. The rear meanwhile, looks smart and quite interesting with the LED elements in the taillights and the chrome strip running all around the car. The Jeep Compass's interior looks just as smart as the exterior with its interesting cabin design. Build quality is mostly good, with just a few hard plastic bits around the cabin. The chunky steering feels great to hold, although the dummy buttons where the cruise control switches would have gone, look quite odd. The instrument cluster is easy to read with its large dials and an informative display unit. And while the white coloured upholstery is sure to get dirty soon in our environment, it does make the interior look luxurious. The cabin also feels a little small when you first step inside, while there aren't too many storage spaces either. However, rear knee room is very impressive while shoulder room and head room are sufficient. 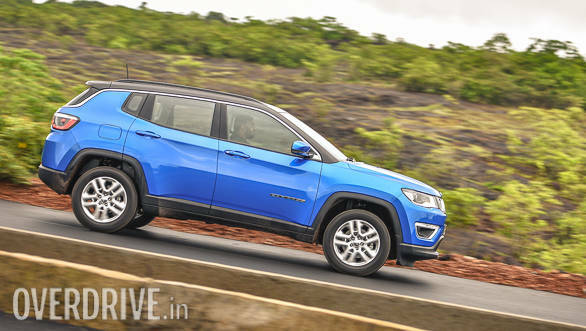 When it is launched, the Jeep Compass will be offered with two engines, both with 4x2 and 4x4 options. The petrol variant will run a 1.4-litre Multiair turbo-petrol engine with the choice of a 6-speed manual and dual-clutch transmissions. The diesel variant, which is the one we've driven, debuts the 2.0-litre Multijet II diesel engine in India. This engine produces 173PS at 3,750rpm and 350Nm from 1,750-2,500rpm, and will be offered with a six-speed manual initially. 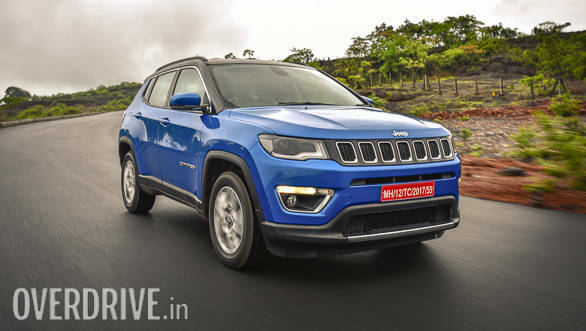 According to Jeep an automatic variant should be on offer in the year. The Multijet II is a big improvement over the first gen engine in terms of refinement. It's significantly quieter and more responsive too. However, it still has some of the old characteristics  a slow revving engine with turbo lag till around 1,800rpm, and then a strong rush of power till the redline. But unlike before power comes in very smoothly rather than aggressively. And despite the lag, it doesn't struggle to pull at all even when in third gear at around 20kmph. The 6-speed manual gearbox meanwhile is really the highlight here. Gear shifts are smooth, precise and have a slight mechanical clink to it which feels great. Overall, the engine and gearbox combination make this Jeep a pretty good performer. We managed to get a decent 0-100kmph time of 11.9 seconds, and an efficiency figure of 11.39kmpl in the city and 14.11kmpl on the highway. What's worth noting, is that this is the 4x4 variant, and we're not sure when or under what conditions the system is activated. The Compass is primarily a front-wheel driven car with power sent to the rear wheels whenever necessary or when the 4x4 lock is engaged. 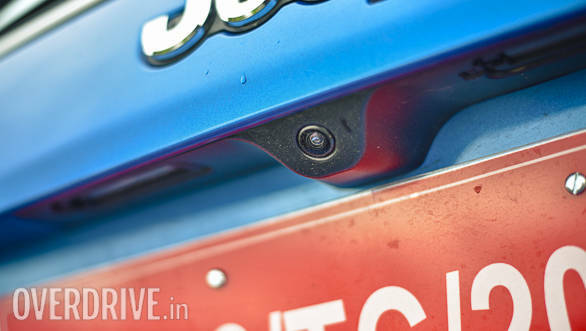 The Jeep Compass gets four off-road modes  Auto, Snow, Sand and Mud. Unfortunately, we didn't really get the chance to test its off-road capabilities. 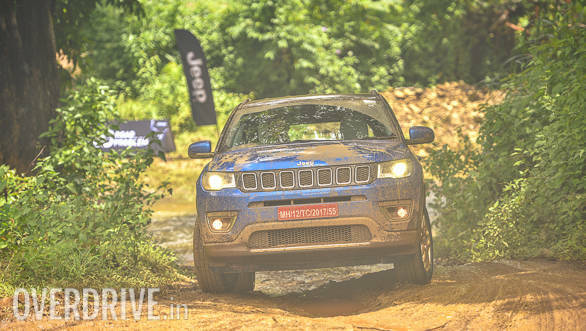 The Jeep Compass's suspension set up manages to bring a bit of comfort, ruggedness and impressive handling. It gets a MacPherson strut set-up at the front and an independent Chapman strut set-up at the back with Koni's frequency sensitive dampers. This system works like adjustable dampers without all the expensive and complicated electrical systems. It uses hydraulic valves to control how much damping happens, depending on the frequency of suspension movement  high frequency (when you drive over bad roads) will reduce damping for better ride quality, while low frequency (when on smooth roads) will increase damping for better stability and handling. As standard, the Jeep Compass gets decent amount of safety features -- ABS, dual airbags, electronic stability control, and hill-start assist. The top-spec Limited variant meanwhile, gets eight airbags, traction control, cornering lights and adaptive brake lights (they flash in case of emergency braking). The features list on the other hand, isn't what one would call loaded, but has got a decent amount of kit. 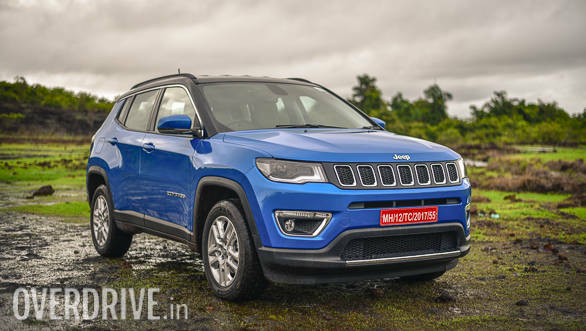 The Jeep Compass gets features like dual-zone climate control, bi-xenon headlamps, auto up/down front windows, a decent 7-inch touchscreen infotainment system and keyless entry and ignition. But you loss out on stuff like auto headlamps, auto wipers and cruise control, which you see in cars positioned lower than it. 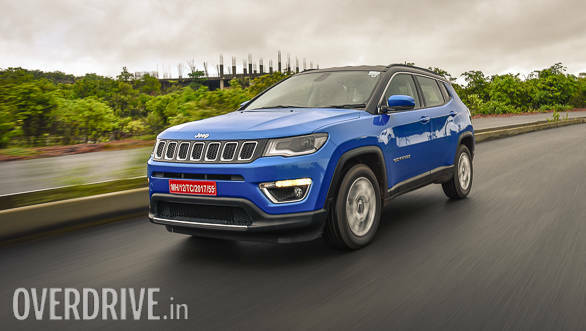 Jeep hasn't officially announced prices of the Compass as yet, but we estimate that it will start from Rs 15 lakh and go up to Rs 20 lakh (ex-Delhi). At that price, the Jeep Compass is a real steal! What you get for that price is good looking, well built SUV, that is practical and fun to drive. What Jeep also has to do to bring in some customers, is significantly improve its service network across the country. If they can do this and keep the price within the estimate, they might just have a winner in their hands.